If you are looking for a temperature sensor that is cost effective and accurate, your first choice may be a thermistor. It is a type of resistor whose resistance changes with change in temperature. Â This article deals with the working, types and applications of a thermistor. Coined from the words â€œTHERmally controlled resISTOR”, thermistor is a temperature controlled resistor. The resistance offered by this solid state temperature controlled device depends on the ambient temperature. All resistors do have a temperature dependency that is given by their temperature coefficients. For most of the resistors (fixed and variable), this temperature coefficient is kept very low, such that the change in temperature does not significantly affect their resistance. On the other hand, the temperature coefficient of thermistor is considerably high, thus their resistance change with respect to change in temperature. Since in a thermistor, physical changes (change in its temperature) tend to change its electrical properties (like resistance),it can be also referred to as transducer. 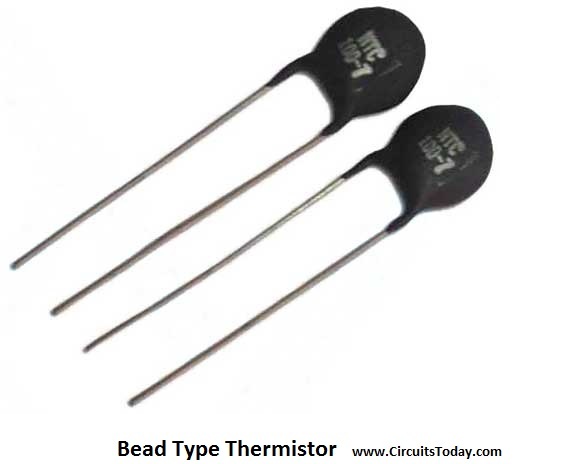 A thermistor is mostly made from sensitive semiconductor based metal oxides with metallised or sintered connecting leads onto a ceramic disc or bead. What are the types of Thermistors? As already discussed, temperature dependence of a resistor is defined by its temperature coefficient. According to this, the thermistors are classified into two categories based on the type of temperature coefficient. There are two types of temperature coefficient namely negative temperature coefficient and positive temperature coefficient. The ceramic semiconductor material used for each type of thermistor, differs, as the temperature coefficient is dependent on the material used. Letâ€™s discuss about each in brief! Definition -Â NTC or negative temperature coefficient thermistor is a device whose resistance decreases with increase in temperature. These types of resistor usually exhibit a large, precise and predictable decrease in resistance with increase in temperature. From the figure we can say that they have a steep resistance temperature curve, denoting good temperature sensitivity. However due to the nonlinear relationship between resistance and temperature, some approximations are utilized to design practical system. ð›¥R = kð›¥T, where k is the negative temperature coefficient of the Thermistor. Like any resistor, Thermistor also dissipates heat whenever a significant amount of current flows through it. This heat is dissipated in the core of the Thermistor, therefore it can tamper the precision of the device. The heat required to increase the temperature by 1oC in a NTC Thermistor, is called its heat capacity. It defines the response speed of NTC Thermistor and hence its knowledge is needed to decide where it has to be used. Definition -Â PTC or Positive temperature coefficient Thermistors are those resistors whose resistance increases with increase in ambient temperature. Types of PTC Thermistors -Â PTC Thermistors are grouped according to their structure, materials used and their manufacturing process. Silistors, are PTC Thermistors that belong to the first group(according to material used and structure). They use silicon as the semiconductor and have linear characteristic. Switching type PTC Thermistors belong to the second category (according to the manufacturing process). This Thermistor has a non linear characteristic curve. As the switching type PTC Thermistor gets heated, initially the resistance starts to decrease, up to a certain critical temperature, after which as the heat is increased, the resistance increases dramatically. 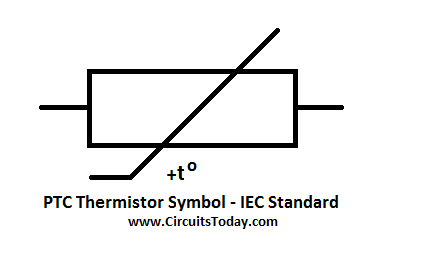 PTC Thermistor Symbol – The following figure shows the symbol used for PTC Thermistors in a circuit diagram. 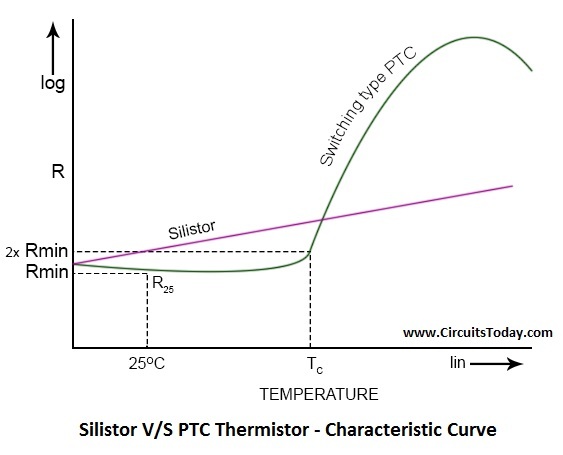 Characteristic Curve -Â The following figure shows the characteristic curve of a Silistor and a switching type PTC Thermistor. We see that, a silistor PTC has a linear characteristic. This means that this PTC Thermistor is quite sensitive to the change in temperature. Its resistance increases linearly with increase in temperature. The switching type PTC however, is different. Due to its poly-crystalline ceramic body, has a nonlinear characteristic curve. 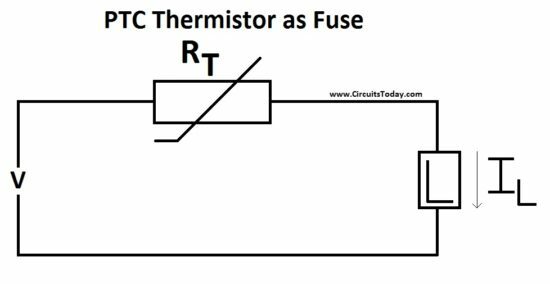 We see from the figure that upto a certain temperature, lets call it a threshold temperature, the resistance decreases with increase in temperature much like a NTC Thermistor. As the temperature increases beyond the threshold temperature, the resistance starts to increase dramatically with increase in temperature. Rated resistance of Thermistor -Â The resistance of PTC Thermistor is rated at a temperature of 25oC. It means that if you find a PTC Thermistor, that has a rating say 200Î©, it implies that this is the value of resistance Â at 25oC. Now that we have discussed about the types of Thermistors according to the type of temperature coefficient, there is another classification based on the shape and size of the Thermistors. Thermistor, whether it is an NTC or PTC Thermistor, has a body made of metallic oxide. The metallic oxide body of a Thermistor can be pressed into different shapes and sizes. They can be either pressed into a bead, disk or cylindrical shape. Therefore, the ones pressed into bead are known as bead Thermistors, those pressed into disk are known as disk Thermistors and similarly, the third class is the cylindrical Thermistors. 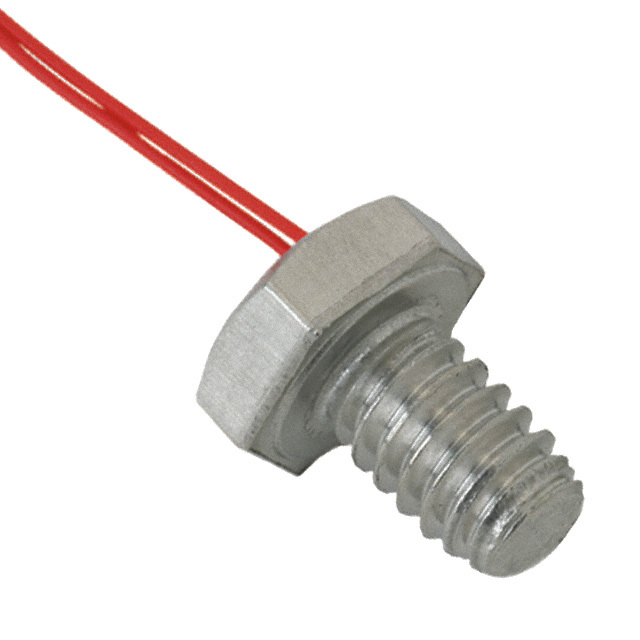 Bead Thermistors are the smallest in size of the lot. The Thermistor works on a simple principle: Change in temperature of the Thermistor, leads to a change in its resistance. How does its temperature change? The Thermistorâ€™s temperature can change either due to external factors or due to internal factors. The most important internal factor is the current flowing through the device. As the current through it increases, it starts self heating its elements. This causes a rise in temperature of the Thermistor. Depending on the type of Thermistor( whether NTC or PTC), its resistance changes with respect to this change in temperature. Externally the Thermistor temperature can be changed by changing the ambient temperature. We shall discuss about some basic Thermistor circuits in the application section next. 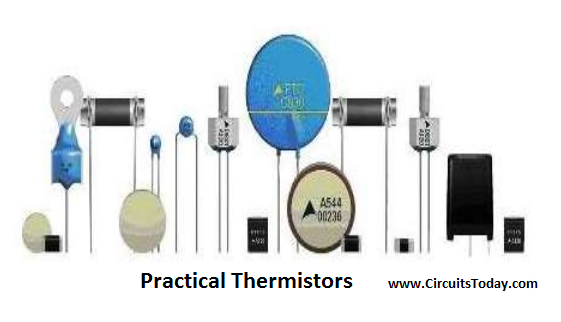 In this section we shall give you aÂ brief about the common uses of each type of Thermistor. Each Thermistor that is NTC and PTC Thermistor are used in different applications according to the need. Apart from the temperature range other criteria that are taken into account while choosing a Thermistor for this application include: Resistance range, accuracy, surrounding medium, response time and dimensional requirements. 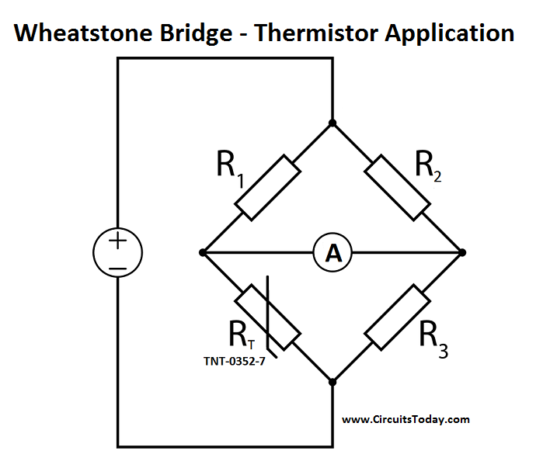 A very basic circuit that uses Thermistor for temperature measurement is shown below. It is nothing but a Wheatstone bridge. Initially, all the 4 resistors (one of them being Thermistor) are balanced, that is there wonâ€™t be any current through the ammeter. A change in temperature will obviously change the resistance of the Thermistor and hence a current will flow through the ammeter. Temperature Compensation -Â Even though all the semiconductors posses a temperature coefficient, NTC has a high sensitivity towards temperature. 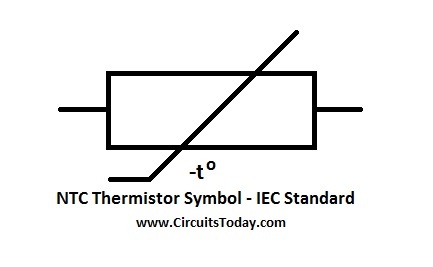 Hence, NTC is opted for compensating undesired response to temperature changes in a circuit. The compensation netwrk mostly comprises of resistors in series (or shunt) and a voltage divider circuit. Screw type Thermistors are preferred for this application as the temperature of the Thermistor and the component that is responsive to the temperature change should match. 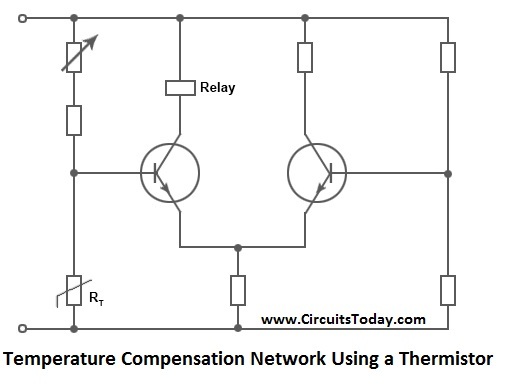 Below figure shows a compensation network using a Thermistor. 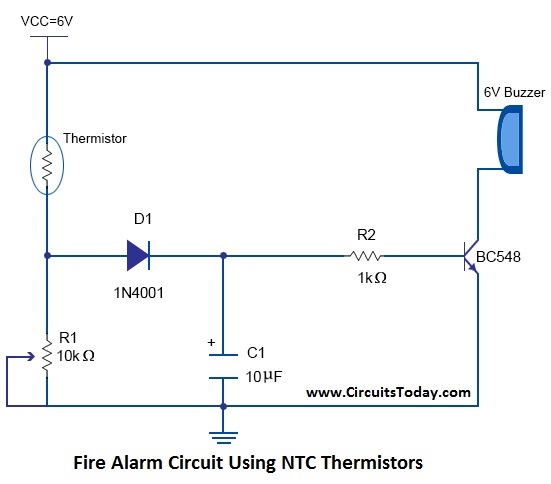 As a Fire alarm -Â NTC Thermistors can be used to build simple fire alarms. A basic circuit is shown in the figure below. In this circuit, the Thermistor resistance controls the voltage across the resistor triggering the transistor switch. As the Thermistor senses an increase in temperature, its resistance decreases, that in turn increases the voltage across the resistor that triggers the transistor switch. The switch triggers the buzzer, hence alerting of a potential fire hazard. Temperature measuring device to monitor temperature of exhaust gas, cylinder head etc. To monitor temperature to maintain the room temperature at certain desired level. As a temperature stabilizer in laser diodes and photo elements. PTC Thermistors can be actually broadly classified into two categories based on their applications. Letâ€™s discuss some of its applications under these categories. Power PTC Thermistors as fuse -Â For circuits that require over current protection, power PTC Thermistors act as a fuse. CeramicÂ PTC Thermistors are a replacement to conventional fuses to protect loads such as motors, transformers etc. Figure below shows a simple circuit using a PTC Thermistor as a fuse connected in series with load. These PTC Thermistors are used a switch in motor starting circuits, Degaussing circuits etc. Due to their Resistance and temperature characteristic , PTC Thermistors are a good choice for Small heaters and thermostats . b) PTC Thermistor Sensors -Â A PTC Thermistor sensor is used in various application. As a level sensor , they are a good choice to detect and control overflow in oil tankers. Another type of sensor, that is made using the PTC Thermistor, is ofcourse the temperature sensor. Here when these PTC are used, only their steep region of R/T characteristic is considered. Also, the resistance is regarded as a function of ambient temperature given that varistor effect is excluded. These sensors come in handy at places where temperature limit is needed for protection purposes. Figure below shows a basic circuit diagram for the protection of power semiconductors by a PTC Thermistor limit temperature sensor. So these were some of the basic applications of Thermistors. These Thermistors are basically not used at high temperatures. For applications where Thermistors need to be exposed to high temperatures, a different kind of Thermistors is used. Letâ€™s discuss about them briefly in the next section. High temperature Thermistors are build differently than the normal Thermistors, as they have to handle high temperatures upto 200oC- 250oC. Here we discuss about omega 5500 series Thermistors. These glass encapsulated Thermistors have a maximum continuous temperature rating of -80oC to 200oC and for intermittent operation the maximum rating 250oC.Â It is a bead type Thermistor having solder able gold plated dumet leads. 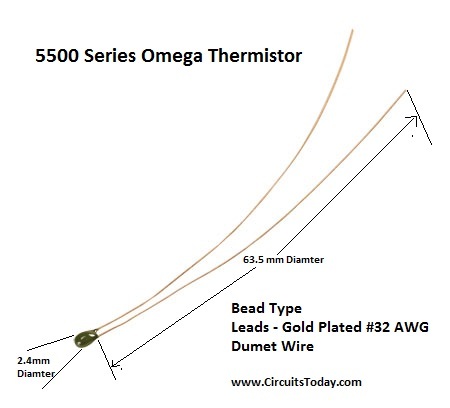 Figure below shows an omega 5500series Thermistor. These Thermistors are NTC type and they have a resistance rating( that is resistance at 25Â­oC) of 2252Î©, 3000Î©, 5000Î©and 10000Î©. Unlike other Thermistors, these high temperature Thermistors are chemically quite stable and are not much affected by aging. This brings to the conclusion of the article. In this article, we have discussed about Thermistors its working and types. Basically a Thermistor is nothing but a resistor whose resistance depends on temperature and hence the name â€œThermally controlled Resistorsâ€ or â€œThermistorsâ€.Â Broadly speaking Thermistors are of two types depending on the way their resistance changes with temperature, namely NTC and PTC Thermistors. Both have different R/T characteristics and hence are used for different applications. 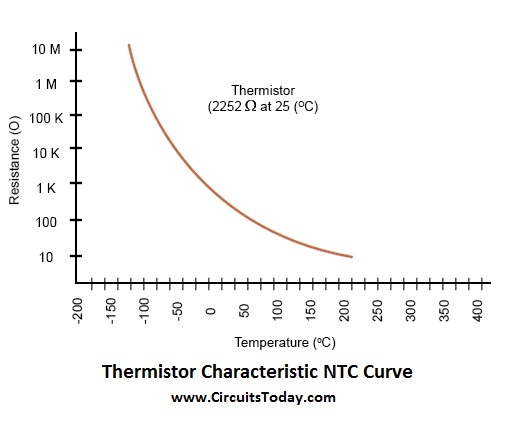 Lets draw a comparison between NTC and PTC Thermistors. That will help revise the basic concepts ofÂ both types of Thermistors. They have a negative temperature coefficient, meaning their resistance increases with decrease in temperature. They have positive temperature coefficient, meaning their resistance increases with increase in temperature. The metal oxides used for their construction are: cobalt, nickel, iron, manganese, titanium. The metal oxides used for their construction are: barium-, lead-, strontium titanate. These Thermistors posses highly non-linear R/T relationship. The silitor PTC Thermistor has a linear R/T curve, hence its resistance very much sensitive to temperature. These are mostly used in temperature compensating circuits, temperature measuring instruments and controllers. PTC Thermistors are a good choice for temperature measurement and control, temperature detection and regulation. Also, they are can be used as a switch and are called thermal switch.